In Finder I used CMD-I a lot to get the standard Finder information on a file, the most important thing being the version number of an application. It would be great to have something similar in NC. My current workaround is a workflow opening the file/folder in an external app (FileXaminer). EDIT: in the shell, the correct program would be mdls for displaying additional Finder/HFS info, incl. version number, e.g. If the Finder info dialogue is enough for you, you can just use "Services -> Show Info in Finder". I have mapped it to Cmd+I in my NC settings. JayB wrote: In Finder I used CMD-I a lot to get the standard Finder information on a file, the most important thing being the version number of an application. It would be great to have something similar in NC. Yep, this is often asked feature, but I think it's a low priority one at the moment. sasha wrote: If the Finder info dialogue is enough for you, you can just use "Services -> Show Info in Finder". I have mapped it to Cmd+I in my NC settings. I was struggling without this feature. Solution from sasha works like a charm. 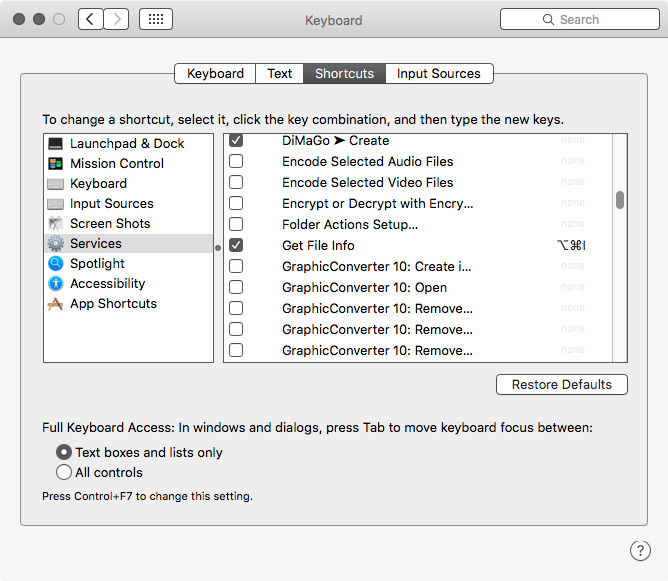 For those who have Finder disabled, you must use third-party tools. I'm currently using the old software FileXaminer, and I'm calling that with a simple open-path-with-app workflow via Services, incl. ALT-CMD-I shortcut. There's also the possibility, if you have e.g. installed LaunchBar, to get some rudimentary file information with entering the name of the file, selecting it (arrow down/up) and using the arrow-right. So i know where to find this, but how do you map it to a hot key in NC settings ? I cant see it in the hot keys list, and i cant add a new hot key not listed ? Im probably missing something very simple here. Mine was 'show info in finder' i did not have 'get file info' in my list like yours. Thanks for pointing me in the right direction though.....mine now works!